Four rotary impellers, mounted one above the other on the left and right, propel the snow as far as 40 meters. Up to 8,500 tons of this white “cargo” can be moved efficiently each and every hour. 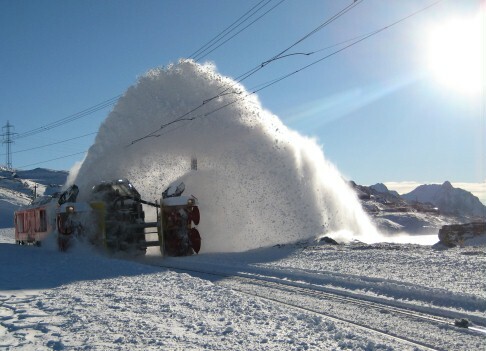 In the Alps, four railway snow blowers, manufactured by the Swiss company Zaugg AG Eggiwil, keep the lines operated by the Rhaetian Railway clear all year round. Thanks to the impressive profile that can be cleared, from three to six meters in width, at a height of 4.63 meters, and due to their enormous power, there’s good reason why the employees of the Rhaetian Railway have nicknamed this “The Beast”. The hydraulic system, built by Rexroth, comprises axial piston units, a concept for the filters and control blocks, and the oil circuit’s cooling system. This applies the diesel power – two times 440 kilowatts – in an ideal fashion.